IRVINE, Calif. (BRAIN) — Shimano says manufacturers apparently didn’t follow its requirements when spec’ing front brakes on some electric share bikes, possibly causing problems that led to Lyft and Uber pulling the bikes from service. (BRAIN) — "Mobility" is a common buzzword in the tech and transportation industries, and in the European bike industry. 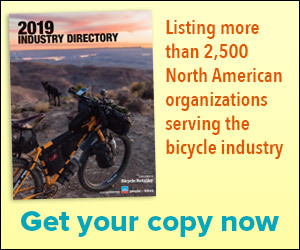 In the U.S. bike industry? Not so much. SHANGHAI (BRAIN) — Multiple Asian news sites are reporting that bike share giant Ofo has dissolved its overseas business unit, retreating from operating in the U.S., Hong Kong, Singapore and France. BEIJING (BRAIN) — Ofo, the world's largest and best known dockless bike share operator, is struggling financially, in part due to demands for deposit refunds from customers in markets where Ofo has stopped operating. NEW YORK (BRAIN) — Ride share company Lyft has completed its purchase of Motivate, the country's largest bike share company. The purchase was originally announced in July. DEARBORN, Mich. (BRAIN) — Axios is reporting, based on multiple unnamed sources, that Ford Motor Co. has agreed to buy the electric scooter startup Spin. BEIJING (BRAIN) — Ofo is now ending its dockless ride sharing service in Japan, once considered a key market for the Chinese company. This year the company has stopped operating in markets in the U.S., Germany, Spain, Australia and Israel. WASHINGTON (BRAIN) — Next Tuesday, dockless sharebike company Lime will offer free rides to the polls on Election Day. Lime will make its share bikes, e-bikes and e-scooters available in more than 100 cities in the U.S. to ride to and from a polling station, up to 30 minutes. BEIJING (BRAIN) — Dai Wei, the founder and chief executive of Chinese bike-share giant Ofo, has stepped aside as the company's top legal representative as Ofo faces multiple lawsuits in China. Ofo has named Chen Zhengjiang, the head of its hardware supply department, as the new legal representative. SAN FRANCISCO (BRAIN) — Dara Khosrowshahi, the CEO of ride-share company Uber, says e-bikes are often the best way to get around a city, especially during rush hours. DETROIT (BRAIN) — After more than a year in operation, Detroit’s MoGo bike share is expanding service to more neighborhoods in Detroit, as well as to five other cities in the region including Berkley, Ferndale, Huntington Woods, Oak Park, and Royal Oak. MEMPHIS, Tenn. (BRAIN) — The new bike share system here, which includes 600 bikes and 60 stations, is the 50th system for Trek-owned bike share provider BCycle. It also is the company's largest smart bike system to date. DETROIT (BRAIN) — On the anniversary of its MoGo bike share program, Detroit is rolling out a pilot program with a variety of adaptive cycles for riders of all abilities. It's one of the first major cities to offer an adaptive cycle share program.